Betting on the NFL can be broken down into so many categories that a gambler could focus on one specific area and probably come away with a profit at the end of the year. If you wanted to focus on double-digit home favorites, or Thursday Night home teams, or underdogs of seven-points or more, you could find value throughout the season and come out ahead if the handicapping was sharp. Two areas that most bettors tend to focus on are home underdogs and large spreads (nine points or more), which seem to happen nearly every week. Let's zero in on those categories and figure out the best way to wager on those lines for Week 5. 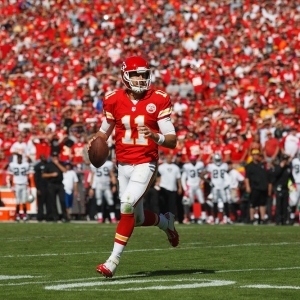 Kansas City Chiefs (-9) versus Chicago Bears : Neither team in this matchup has been particularly good against the spread as both currently hold a 1-3 ATS mark. Kansas City has shown flashes of solid play on both ends of the ball, even though dumb mistakes and turnovers continue to be their biggest fault. Chicago has played much better on the defensive end than the squad is getting credit for and currently ranks seventh and fourth in fewest total yards and passing yards allowed, respectively. Kansas City probably has the advantage in this matchup. However, should an Andy Reid-coached squad ever be trusted as a nine-point favorite? Prediction: expect the Bears to cover this matchup. Green Bay Packers (-10) versus St. Louis Rams : Green Bay has been a monster through the first games of the year, but St. Louis has been the monster killer through the early part of 2015. The Rams probably have the two most impressive wins of the season with solid victories over Seattle and Arizona in Weeks 1 and 4, respectively. The NFC West is a brutal division that has turned the Rams into a hard-nosed defensive team that can put a scare into anyone in the league. Who knows if St Louis can actually make the playoffs. But what we do know is that the team can shut down just about anyone. Green Bay is still 4-0 ATS and is bound for a bit of a letdown. Prediction: Expect a tough matchup that Green Bay wins but does not cover. Dallas Cowboys (+10) versus New England Patriots : Dallas is without its star wide receiver and franchise quarterback Tony Romo for the foreseeable future. Even though backup Brandon Weeden has been solid at times, Week 5's matchup against the defending Super Bowl champions feels like a massacre in waiting. The Patriots seem to be interested in blowing out teams and running up the score, similar to the team's undefeated regular season following the aftermath of "Spy Gate" in 2007. Prediction: this could get ugly very fast; take New England. Tennessee Titans (+3) versus Buffalo Bills : The Titans are coming off a bye after dropping two straight games early in the season, and they will now get a three-game homestand, which will do nothing but help rookie quarterback Marcus Mariota. Buffalo, on the other hand, has been wildly inconsistent, rotating wins and losses through the first four weeks of the year, and even letting those inconsistencies manifest on a quarter-by-quarter basis. And for all the talk of coach Rex Ryan revitalizing the Bills defense, the team is ranked 29th in most passing yards allowed and 22nd in total yards allowed. Prediction : Mariota has already shown signs of being a special quarterback. This is a great spot for the home underdog. Oakland Raiders (+5) versus Denver Broncos : Oakland is currently 2-2, and the team is sitting on two more wins than anyone would have expected this early in the season. The team has been so impressive lately that it was even a road favorite last week against Chicago. Facing Peyton Manning and the Denver Broncos, however, will bring a different set of problems than the Raiders' previous matchups against Baltimore and Cleveland did. Denver is 3-1 ATS and covering games by an average of four points per matchup. The only time that Oakland faced a quality team this season was during Week 1 against Cincinnati, and that resulted in a 20-point loss. Prediction: Expect the Denver train to keep rolling and racking up wins and covers. Detroit Lions (+2.5) versus Arizona Cardinals : Detroit is 0-4 and coming off a controversial loss against Seattle, but at the moment all the value seems to be sitting with the Lions. Arizona is a fantastic team with Super Bowl aspirations, but there is always strength wagering on a desperate home underdog with talent on the roster. Detroit isn't really a 0-4 team, and underachieving, bad calls, and a few bruised up players has put them in this situation. Desperation can be a huge thing in sports, so expect the Lions to put up a fight and approach this game with a chip on their shoulders. Prediction: Arizona could easily win this game and cover this spread. All I am saying is Detroit has value because of its desperation. Want free NFL picks? Doc's has you covered. New clients can take advantage of this great offer of $60 in free Doc's Sports members' picks for any handicapper on Doc's Advisory Board. Just check out these guys' pages and see what great work they have done making money for themselves and their clients over the years. Click here for this exclusive $60 picks offer. Also, get three handicappers for the price of one when you sign up for a full-season football package! Click Here for details.